William Deresiewicz was twenty-six when he first was introduced to the woman who would change his life. Jane Austen has taught William everything he knows about everything important and has made him the person he is today. But before he was an Austen scholar, William was a guy who looked down on Austen’s ‘chick lit’ and dreaded reading Emma in grad school. He was surprised to find wisdom in Austen’s words, and find a bit of himself in Emma. 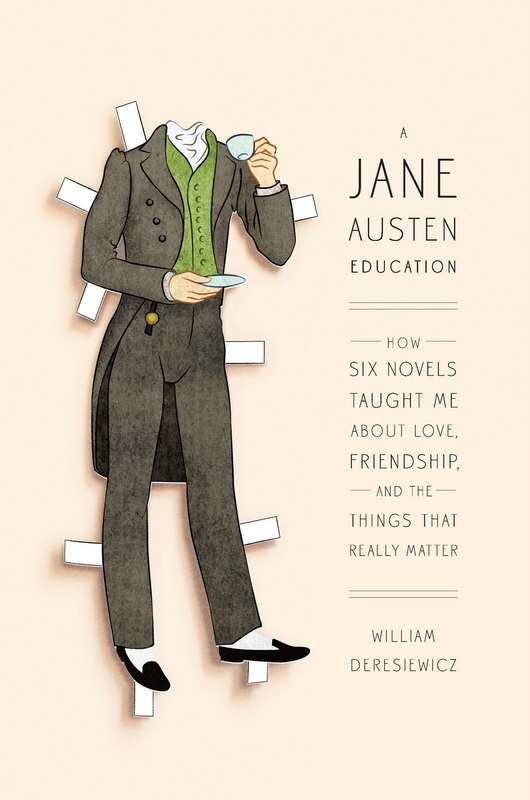 As he immerses himself in the world of Austen’s six novels, he finds that they share lessons that are relevant to his life. As he reflects on his life as he first discovered Jane Austen and how the books affected him, William explains how the important truths of life are explained between the covers of Jane Austen’s novels. This is the first non-fiction book I’ve read for fun in a while. I was drawn to the cover as well as the topic. This is probably a book about Jane Austen’s works for people who enjoy them, but are not English majors. The author ties in the books with his life as he was reading them as a grad student at Columbia. As he reads each book, he reflects on a certain area of his life that is relevant to the novel and how it helped him grow as a person. If you’re only interested in reading about Jane Austen and don’t care to hear about the author’s life, then skip this book. I, however, mostly enjoyed the parts about his life. I know a lot of people who are like the author who, as the book begins, is arrogant and confident in his opinions. To be honest, the author still seems to be arrogant but I liked him overall. It was interesting to see Austen from the perspective of someone who was prejudiced against her, and even didn’t like her work at first. Sometimes (especially towards the end) it felt like he was stretching things when tying each book with his life. While this is a simplified literary criticism, I enjoyed some of the author’s insights. The author is a professor, but you could tell that he wrote this book for people who don’t think like English majors. I found some of his ideas interesting, but he doesn’t offer a very broad analysis. He focuses more on the lesson leant rather than going into depth on other aspects. If you haven’t read all of Jane Austen’s novels, then do not fear, for the author writes as if you haven’t. Of course, if you haven’t read any of Jane Austen’s novels, I’m not sure if this book will be of much interest to you. However, it does a good job of explaining what people love about Jane Austen, so it could convince someone to finally pick up her books. All the same, I just don’t think it would be as appealing for people who aren’t Janeites. While sometimes it was nice to have a refresher on some of Austen’s novels, I didn’t like how the author wrote as if the reader was completely clueless, like when he wouldn’t tell right away which man Jane described as “just what a young man ought to be.” While things like this bothered me at times, the writing was very good and the author offered an interesting perspective that made me think. Overall, I’d recommend this to fans of Jane Austen who are interested in a lighter literacy criticism that is part memoir. A Jane Austen Education was entertaining and enjoyable, and reminded me why I love Jane Austen. I read Northanger Abbey at school and have always remembered it. I am not sure why. I heard an extract of this book's audio version on Elaine Charles' radio show (http://bookreportradio.com). I think that I am now starting to get Jane Austin and will certainly read this book and at least some of her novels.